These super fun and colorful, kids' rain boots are perfect for splashing around in puddles. They are made of natural rubber and include topside handles that make them easy for kids to put on themselves. The convenient handle design even improves children's hand-dexterity and fine motor skills. Oakiwear's high-quality rainboots are sure to keep your kiddos dry in the rain and puddles. These new designer boot sizes are pretty true to size, so if your toddler wears a size 6 shoe, they will likely wear a size 6 in our rubber boots as well. Rubber is the highest quality material to make kids boots out of since it doesn't smell like chemicals. Many boots today are made out of PVC, which sacrifices quality, comfort, and flexibility for price. 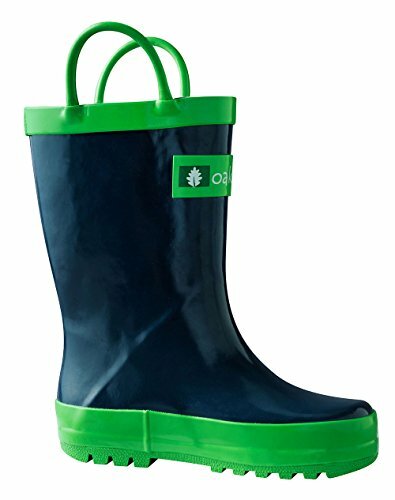 Oakiwear understands that these boots need to be made for more than just a rainy day, they need to be perfect for taking your child fishing, camping, to the park, or on a picnic. The unique sole design is comfortable for children and is much easier to walk in than boots with an arch. The construction of the bottom not only provides comfort and stability, but also has been carefully sealed to keep your child's feet warm and dry. Being in the Northwest, Oakiwear practically has a PhD in "Rain-ology." Oaki strives to only create only top-of-the-line kids products that you feel confident in. These boots fit and feel great; your child will look fantastic! BEST KIDS BOOTS ON THE MARKET | Oakiwear's mission is to create an easier way to make your children excited to adventure. Our childrens boots and toddler boots handles help with hand-dexterity, our design keeps feet dry, and our goal is to inspire kids to play harder than ever. You will LOVE our boys and girls rainboots! Oakiwear. Where Explorers are Born.